Growing your own tomatoes is easy and rewarding. Follow our step-by-step guide to growing tomatoes. You can start in January or February onwards in order to get tomatoes from the end of spring onwards. You need two to three months to have seedlings that are ready to plant. Sowing seeds is the most affordable method: sow tomato seeds (no more than 2 seeds per cm2) in small pots filled with compost and keep them warm and in the sun. Don't be tempted to use garden soil as this harbours bacteria which are harmful to tomato plants. Cover with a bit of compost (0.5cm) and dampen them (using a water spray ideally). Make sure that the soil doesn't dry out or become too wet, else the seeds will rot. In around ten days or so, seedlings will appear! Consistent heat is the key at this stage. If you haven't got a heated greenhouse, the easiest way is to buy a plant from your local garden centre. A "good plant" is about 20cm in height and its leaves nice and green (without flowers). That said, you can still grow seedlings inside and move them outside when the threat of frost has gone. Once the seedlings have developed a little (2 to 3 weeks after sowing the seeds), it's time to transplant them to pots because the small pots can't provide enough nutrition. Also, if your plants are turning yellow, it's maybe because they've depleted the soil: it's time to pot them into their final surroundings or into a bigger container. Prick out your tomato seedlings as soon as the first two true outer leaves have formed. Do so by gently teasing them out with the back of a teaspoon and holding them by the leaves. You can easily damage the plant if you lift by the stem. Along with consistent heat, adequate and consistent light is also essential from now on to promote healthy growth of your tomatoes. Now it's time for "potting on" (putting them into pots). After pricking out your tomato seedlings, select the firmest ones and place them into 8cm (3 inch) pots (nothing bigger as the roots needs to be encouraged to develop) and top up with multi-purpose compost regularly. Make sure you space them out by about 40cm (except for the smaller varieties which can be less spaced out). If you're growing your tomatoes in a greenhouse, use pots that are no smaller than 22cm (9 inch) for the final position. Alternatively use a growbag - they're very convenient as you just open the bag and put the plants in (usually 3 plants). At this stage, the young plants need careful watering. Overwatering at this stage will cause setbacks or loss of tomato plants. If you're not growing them in a greenhouse, water them less often and put them in a cooler place, in order to get them used to the future conditions they'll be developing in. However, wait until mid-May before planting your tomato plants in your garden or in a window box. This is because the risk of frost will have passed by then. After potting on, commence feeding once the first truss (the stem that supports the tomatoes) has grown and is stable. If you start feeding too early, most of the nutrients will go into the plant and not the fruit. For further information on this, see the section further down entitled "what care is required for growing tomatoes?" Plant a stake at least 1m high next to each plant. Tomato plants grow upwards and when the fruits arrive, the branches will bend under the weight and might break if they aren't supported. If using a growbag, a frame can be purchased from the garden centre which helps to support the tomato plants. As your plant grows, attach its stalk to the stake (every 20 to 25cm) with string, leaving enough slack for future growth so as not to damage the plant. When the plant grows above 1 metre, strengthen the attachments because the weight of the fruits will increase the pressure. When your plant begins to bow under the clusters of fruits (at least 3 or 4), cut the top off the plant to ensure bigger and better-tasting fruit. A good healthy plant's foilage should appear nice and green. Tomatoes appreciate a sunny environment that's sheltered from the wind. They need at least four or five hours of sun a day! If you haven't got a greenhouse, position them so that they are facing south or south-east if possible. The best neighbours for your tomatoes are asparagus, garlic, cucumber, pepper, onion, radish or aromatic herbs such as mint, basil, parsley, sage, thyme or rosemary. However, avoid growing cabbages, potatoes or fennel near your tomatoes. What care is required for growing tomatoes? Tomatoes need copious amounts of water. As a rule of thumb: never let the plants dry out but avoid waterlogging. Water them twice a day in a greenhouse and less often if growing outside. You can buy watering kits which drip-feed the tomatoes as and when they need it. Once you've put the plants in the pots once the first truss has set, feed them with a seaweed-based food which has got the most nutrients for what they need to ripen (you can buy mixtures that you simply add to the water in the watering can). If you're using compost with an element of food in it, you won't have to feed your tomato plants as often as if you're using compost without feed. You need to regularly pick out the little side shoots on the edges of branches which use up the plant's sap (it's much better to reserve this for your fruits!) Do this when the shoots reach a few centimetres. This isn't necessary for bush or trailing tomatoes, however. What sort of tomatoes to grow? Adapt the variety you're growing to the size of the container and the space you have available: in a small window box, stick with cherry tomatoes (trailing bush variety) for example. Bush tomatoes are smaller and designed to be grown outside because they're more tolerant to the weather. They're ideal for patios or where space is limited. Trailing tomatoes (for hanging baskets) are another good alternative if you're short on space. Ask at your garden centre for more information about the different tomato varieties to choose from. If your plant ends up with large brown spots on the leaves and stalks, and if mould appears under the leaves during damp weather, it might have been affected by tomato blight. Take off and destroy affected leaves and branches (don't put them in your compost!). If too much of the plant has been affected, throw the whole plant away. If you're growing tomatoes in a greenhouse, the problem could be caused by a lack of ventilation, with excess condensation creating mould. When it's really warm, leave the greenhouse door open and throw a bucket of water on the floor. Tomatoes are also prone to whitefly that lay eggs on the underside of leaves. You can buy all kinds of sprays to combat whitefly, and for eco-minded tomato growers, organic preparations are readily available. As a preventative measure, use fluorescent sticky strips (available from garden centres) that attract and trap the bugs. 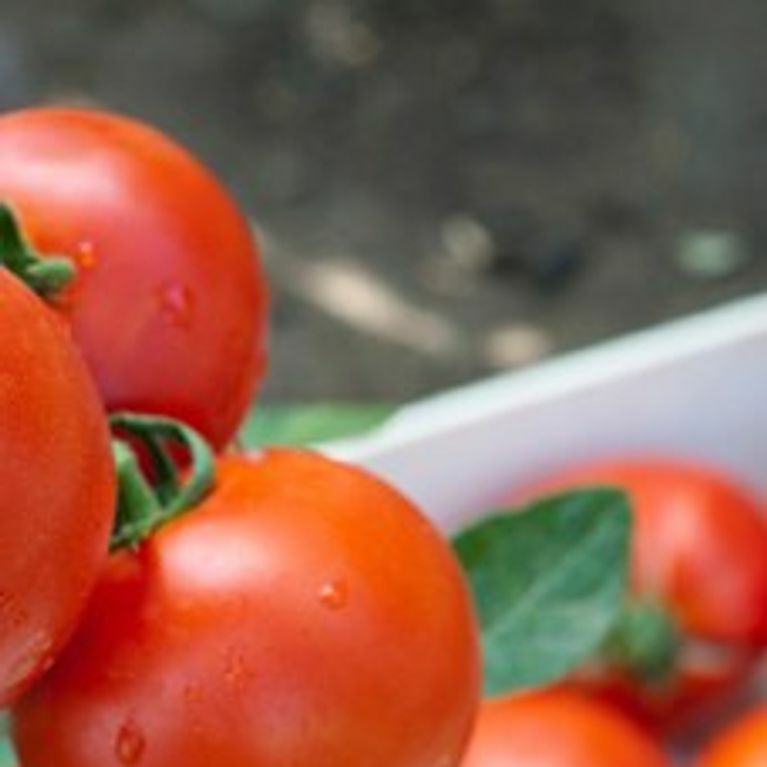 To minimise the risks of tomato pests and diseases affecting your tomatoes, make sure that all pots are washed thoroughly with soap and water before putting anything in them. Cleanliness is really important because bacteria and bugs will enjoy making a home out of your dirty pots, before attacking your plants once they're potted. If you have a greenhouse, spray disinfectant onto the glass, bricks and floor. Wipe it all down and once dry, put your plants in. It's important to keep your greenhouse clean after you've put your tomato plants in: remove dead leaves as they attract bugs and disinfect regularly. Don't remove the leaves from your plant. Not only will removing them mean the fruits take longer to ripen, but it will also reduce their sugar levels. For the last remaining green tomatoes picked at the end of the season, ripen them in an airing cupboard or on a window ledge so that they naturally acquire a red colour after a few days. Alternatively, if you have a lot of green tomatoes left, make some chutney! Small, non-glass greenhouses are readily available and can be inexpensive. For a little extra expense, invest in one and your tomato growing experience will be far more rewarding. Finally, don't forget that growing your own tomatoes should be fun! If you have any questions, don't hesitate to ask at your local garden centre for advice.